Several years ago, I used to buy a vegan tuna product called Tuno. It was apparently available in cans, which I never saw anywhere, but the kind I bought came frozen in a little tube. I had recently gone vegan, and this was a good replacement for canned tuna fish, which I used to eat a lot of. However, Tuno suddenly disappeared from the frozen food section, and then I sort of forgot about tuna and fake tuna altogether. But when a friend of mine asked if I could come up with a new version of this chickpea salad, which she and her husband frequently make and eat for quick lunches and light dinners, I began to think about vegan tuna again, and decided to try using hearts of palm to see what would happen. This new-to-me ingredient that I recently used to make vegan crab cakes is fantastic, but I discovered that simply chopping it up and mixing it with vegan mayo creates a mushy canned tuna analog, and the citric acid added to the can imparted a bitter taste that I didn’t really like. 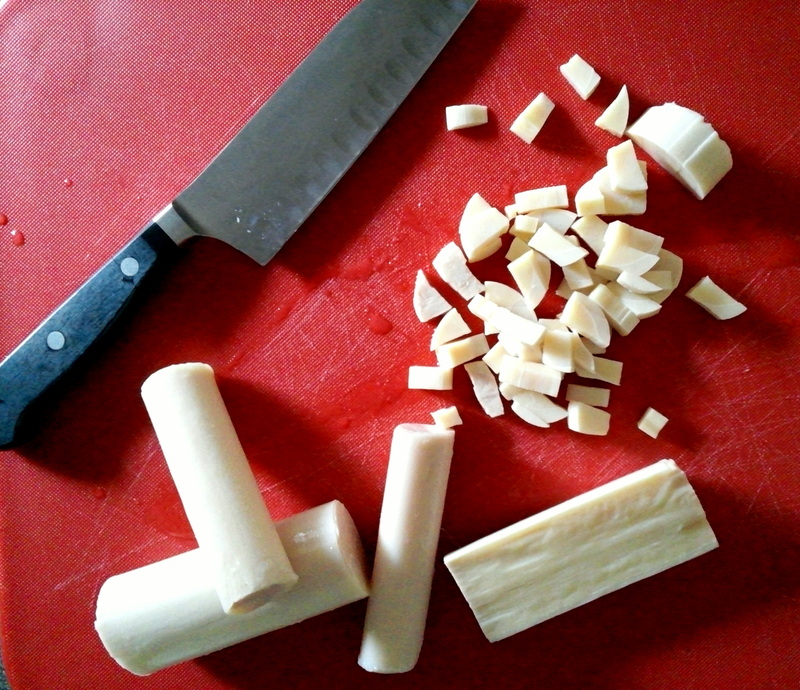 So to get rid of the tang, I chopped the hearts of palm up finely, then soaked them in water to remove some of it. I then drained and gently pressed them before baking them to steam off some of the moisture to prevent any mushy texture. The results were fantastic: this is a nicely textured, flavorful and rich alternative to tuna salad, and is quick and easy to whip up. The chopped celery and celery seed taste amazing together here and are perfectly rounded out with a touch of dried dill, while the kelp granules give it the right amount of faux fishiness and subtle saltiness. This easy, versatile and rich filling won’t fool anybody into thinking it’s actually tuna, but its gently herbed and nicely textured quality makes it a lovely, interesting and viable alternative. Finely chop up the hearts of palm, then place into a fine-meshed sieve and gently rinse under cold water. Transfer to a fresh bowl of water and allow to soak for at least 10 minutes. While your chopped hearts of palm are soaking, preheat your oven to 350. Line a baking sheet with a silpat. Once your oven is preheated, gently pour the hearts of palm back into the sieve and drain well. 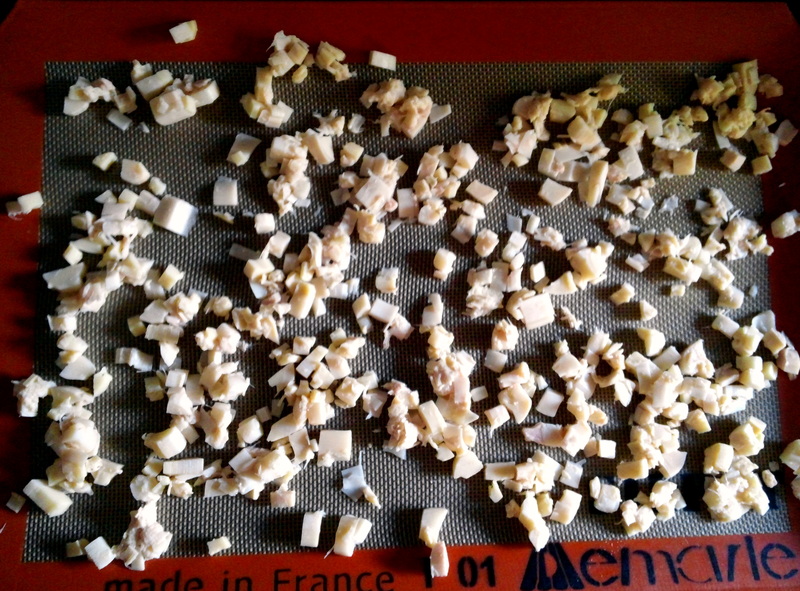 Press down a bit—enough to remove as much water as you can, but not so much that you smash the hearts of palm. Spread the drained hearts of palm onto the silpat in an even layer and bake for 20-30 minutes, gently stirring them every 10 minutes to release some of the steam, but taking care not to let them brown. Gently smash up about a half of the hearts of palm with a fork, then transfer the entire contents on the silpat to a large bowl and add in the kelp granules, dill and celery seed. Stir gently to combine, then fold in the celery, then the vegan mayo. Place the mixture into the refrigerator to chill for an hour or two or overnight to allow all of the flavors to blend, then serve with crackers, or spoon onto a sandwich with a little extra vegan mayo. That looks nearly like tuna salad 😉 it used to be my favorite before I became a vegan 🙁 but I'm glad there are so many vegan alternatives to make nostalgic creamy salads! This is really intriguing! I used to buy "tuno" in a can, years and years ago too, and I was a little bummed when it just disappeared. I also make a chickpea version of a "tuna" sandwich spread, but never thought of using hearts of palm. I will have to try this out! Thanks! these sandwiches are too cute! I love hearts of palm – isn't it eerie how closely it can resemble a tuna or chicken? I like the tang, but I also love how you took steps to remove it! Thanks Kristina! Yes, the flakiness is spot on! I like the tang of hearts of palm in vegan crab cakes, but something about it in this application just didn't work out — I think it just competed too much with the mayo! What a great idea for texture; it looks really appealing. wow this is amazing! i have actually been missing tuna, I have never found a good substitute, i'll need to add this to the must try list! I hope you enjoy, Kristen! So interesting, to use hearts of palm instead of chickpeas like I use in every possible kind of salad! I can't wait to try this. I served these last night with your minted pea soup! The texture was so interestingly spot-on compared to tuna! As always, the presentation sold me. I just love arranging these meals. I don't know if you purchased bread that was circular like that, but I used a biscuit cutter to get the same result. Funny that you had just come out with this recipe right after I tried your chickpea salad sandwich (which I will write on in a minute). Yes, that what I did too with some soft vegan potato bread. It made everything taste light, fluffy and la-de-dah fancy! Thanks for trying it out and your kind feedback,Leila! Never having tasted hearts of palm before, I made this for the first time a few weeks ago. I didn't have celery seed or kelp granules, but did have sushi wraps on hand (which I finely chopped). It was so good, I ate it straight from the bowl I made it in. My mom, a real tuna salad sandwich lover, really enjoyed it. The second time I made this I didn't bake the hearts, and that makes it or breaks it for me. The brine-y flavor was still to prevalent. I baked the hearts last night, and the recipe was back to fan-friken-tastic! I am thrilled you and your mom enjoyed this! Thanks for sharing your comments here. I agree with you on the brininess — I dislike the taste too, although some people like it! Nobody asked about the little rounds of bread, how do you make those? They are made by using a biscuit cutter with regular 'ol slices of bread. How long does this keep in the refrigerator? Does this freeze well? I’m considering making this for a brunch potluck, so I need to make enough for 12 people (or at least 12 bagels), and given my small oven, it would make more sense to prepare this in advance. Amy, it’s best to use this within a day or two. I would not recommend freezing it — I suspect it would get very mushy once thawed.